This DIY Body Scrub Will Leave Your Skin Feeling So Smooth... All For Rs 200! Finding a 'good' body scrub has definitely been challenging for me. Some of them are quite pointless and the rest of them are OKAY but expensive. There's never really been a body scrub that's fit my budget and my expectations. I haven't really had my skin feeling touchably soft and properly exfoliated until I tried this DIY. I didn't go into it thinking I'd love it this much but I was so pleasantly surprised! I recently purchased a body scrub from a brand known to specialise in bath products for more than Rs. 1,000. Spending this much on a scrub that I will use up to 3 times a week is an absolute splurge! I found an old bottle of walnut shell powder lying around from a previous DIY and decided to use it to whip up a quick n' easy body scrub. DIY-ing on a weekend is probably one of my FAVOURITE things to do especially when it takes 5 minutes! This DIY face, body and lip scrub is going to leave you mind blown too, I promise. And it won't cost you more than 200 rupees! 1. 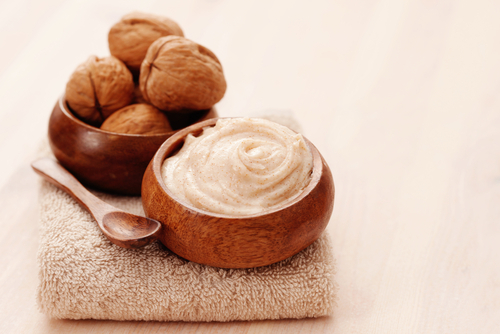 Walnut shell powder has a coarse texture that works wonders for exfoliation! The ETHERIC Walnut Shell Powder (Rs 160) is your perfect budget buy. Take about half a cup of body wash in a bowl, add 1-2 tbsp of walnut shell powder and mix it up. Go have a shower and use the scrub like you normally would. It's going to leave you touching yourself - in a good way! Be prepared for super soft, smooth skin. If you're feeling fancy you can add a few drops of essential oils like rose, lavender, tea tree and peppermint. After using my DIY scrub, my skin felt like it had a new life. I also asked my husband (my guinea pig for all my DIY's) to try it and he loved it too! You can even mix it with a little bit of vaseline to make your a DIY lip scrub! You're welcome ladies AND gentlemen! Have a good scrub, oops I meant day.